Myanmar must ease restrictions on citizenship and movement for its minority Rohingya population, a commission led by former U.N. Secretary General Kofi Annan said Thursday. The commission also called for Myanmar to quell its violent crackdowns on the Muslim minority Rohingya in order to bring peace to Rakhine state, where most Rohingya live. Years of friction between the Rohingya and Myanmar's Buddhist majority exploded in October last year with a military crackdown in response to attacks on border police stations that left nine police officers dead. During the crackdown, thousands of Rohingya fled to neighboring Bangladesh complaining of systematic killings, arson and rapes by Myanmar military forces. The yearlong U.N. commission, tasked with healing divisions between Rakhine State's religious and ethnic groups, released its final report Thursday, a day after submitting it to the government. The report detailed actions the government needs to take to "prevent violence, maintain peace, foster reconciliation, and offer a sense of hope to the state's hard-pressed population," the commission said in a public statement. Former U.N. secretary general and chairman of the Advisory Commission on Rakhine state Kofi Annan, center, arrives for a press briefing on the final report on Rakhine state, Aug. 24, 2017, in Yangon, Myanmar. "Tensions remain high and they risk becoming worse. Violence will not bring lasting solutions to the acute problems that afflict the Rakhine State," Annan told a press conference in the Myanmar capital, adding "the status quo cannot continue." Underscoring the commission's awareness that its recommendations on citizenship and freedom of movement for Rohingya will be a flashpoint for the Buddhist majority in Rakhine state, Annan said: "The Commission has chosen to squarely face these sensitive issues because we believe that if they are left to fester, the future of Rakhine State — and, indeed, Myanmar as a whole — will be irretrievably jeopardized." The report — released after a year of research including meetings with political and religious leaders, civil society organizations, communities across the state, and others — concluded that poverty is a central issue in Rakhine state. The report also provided recommendations on cooperation with Bangladesh, which continues to harbor tens of thousands of Rohingya. Annan called on the international community to "continue to play a strong, generous and impartial role in support of the national efforts needed to help Rakhine move forward." By stressing the need for impartiality, Annan addressed concerns of the Buddhist majority that outside groups were biased toward the Muslim minority. The Myanmar government responded Thursday on its Facebook page, saying it will implement the recommendations "as much as possible depending on the conditions on the ground." Kofi Annan, chairman for Advisory Commission on Rakhine State, talks to journalists during his news conference in Yangon, Myanmar, Aug. 24, 2017. Myanmar's de facto leader, Aung San Suu Kyi, has been criticized for not speaking out more forcefully about the problem, even as the military conducts operations against Rohingya militants that have resulted in widespread claims of human rights abuses. The government has rejected the criticism. U.N. spokesman Stephane Dujarric noted the report's "emphasis on issues related to identity and citizenship, particularly its call for freedom of movement for all people, as well as the need to address the root causes of violence and reduce inter-communal violence." 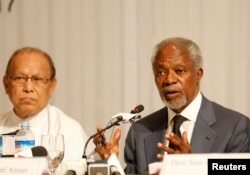 He said the United Nations stands ready to help the government implement its recommendations. Human Rights Watch (HRW), a consistent critic of Myanmar's treatment of the Rohingya, called the commission's recommendations "positive." "Those are recommendations that the government should take up," Phil Robertson, HRW deputy director for Asia, told VOA Burmese. "The challenge right now is whether the civilian government has the political will." Robertson pointed out that during the commission's investigation, the government said "they would try to faithfully implement those recommendations. Now, it's the day, and the government is going to have to be clear about what they are prepared to do. Ideally, they will give a timeline, when the law would be reformed." Matthew Smith, executive officer of the advocacy group Fortify Rights, told VOA Burmese that the Advisory Commission recommendations encourage the government to take concrete steps to end enforced segregation of Rakhine Buddhists and Rohingya Muslims and "revisit" the nation's 1982 Citizenship Law. "The citizenship issue is certainly at the root of many of the problems in Rakhine State and the 1982 Citizenship Law has actually created the world's largest population of stateless people in a given country," Smith said. "The good thing is that can be fixed," he said. "So, the Annan Commission very rightly encouraged the authority, recommended the authority to tackle the issue." With the submission of its final report, the Advisory Commission on Rakhine State has completed its mandate and will disband.